Let’s take a moment to remember all those who served. We are excited to tell you that we now have Twisted Citron Distress Ink in the house! I suspect it will go fast! 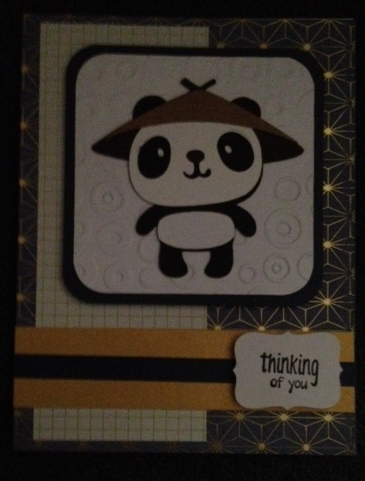 Also, MemoryBox has shipped us an order! We should have it in by Tuesday, check it out! 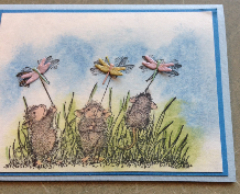 Join us Tuesday May 26th at 6:30pm for a free demo by Cheryl Harwick, featuring Lawn Fawn stamps, paper and dies. Did you try the techniques Stacy showed us last week? If you did, bring in your sample to share at the Demo for a chance to win a small prize. As many of you know, Beverly Mason lost her Father recently. We posponed her class last Thursday. If you are interested in taking her class this Thursday, please register by Tuesday. If you registered for last week’s class, we will see you Thursday! Please preregister. Participants need not bring their Cricut unless they want some help with their machine. Sat, May 30th-1230pm Cheryl Harwick Distress Ink Watercolor Technique Class. 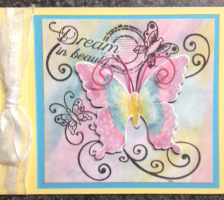 Learn to use Tim Holtz Distress Markers to water color stamped images! Last week Operation Write Home announced their plans to wind down the organization. You can find more information on their decision athttp://operationwritehome.org/finishstrong/. 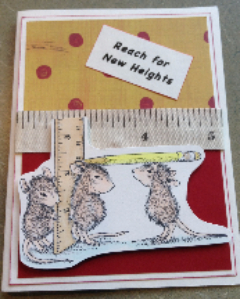 If you have cards that you would like to donate to OWH, please bring them to the shop no later than June 25. This will be our last shipment to OWH, and no additional cards will be accepted. 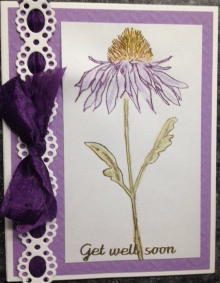 While the OWH decision is somewhat disappointing, there are still a number of other organizations (both local and national) that may be in need of handmade cards. We will be looking into those opportunities, and will get back to you in the coming months with recommendations. If you know of any organizations that need this type of support (such as nursing homes, veterans homes, etc. ), please let me know. June 18th Kathy Snyder Water Color Techniques using watercolor pencils. June 20th Summer Fun Round Robin. 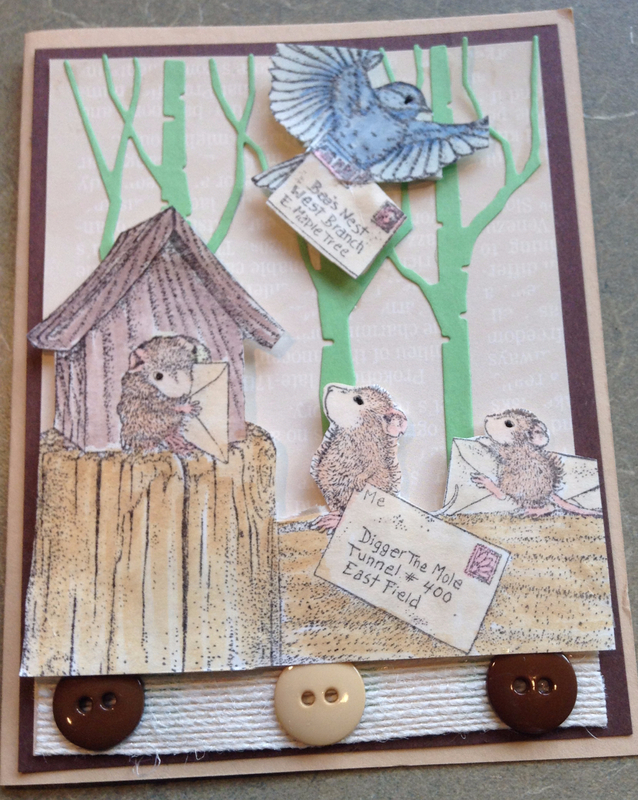 June 27th Nancy Pietras “Mice Gone Wild!” card class. 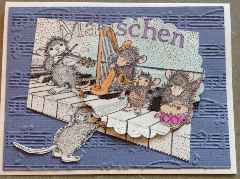 A fun-filled class with a variety of techniques using the house mouse theme. It’s time to sign up for the garage sale! If you want to use your number from last year, please let us know when you register. We will have a two day sale – Fri, June 5th & Sat, June 6th. Would you like a way to get rid of your unused, gently used or not needed scrapbook tools, paper, stickers, embellishments, rubber stamps, inks, supplies, etc.? 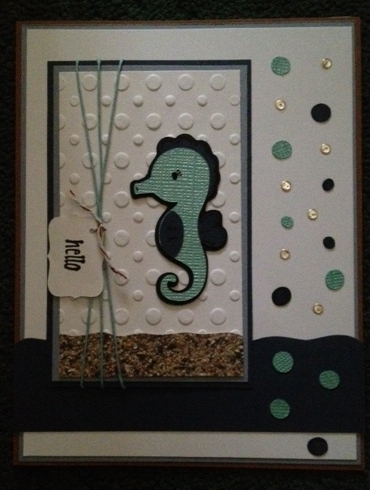 Let us sell them for you at our Paper Crafter’s Garage Sale! 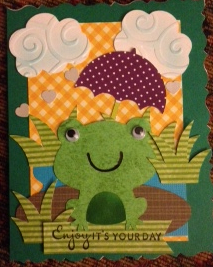 *Only paper crafting tools and supplies are allowed in this sale. 1. Call or stop in by Wednesday, June 3 to register and get a seller’s id number. The fee is $5.00. 5. All items should be placed in a plastic tote or sturdy box. Make sure that the plastic tote or box, lids and any other containers are labeled with your name or seller id number (masking tape is fine). 6. 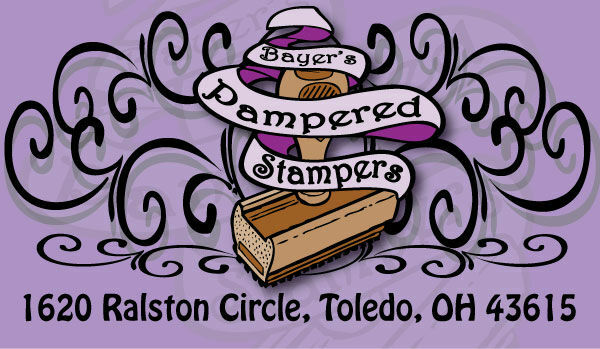 Drop off your items at Bayer’s Pampered Stampers on Tuesday, June 2 after the Demo or Wednesday, June 3rd between 1230pm & 630pm. Please call Bayer’s in advance if you need to make other arrangements. 7. 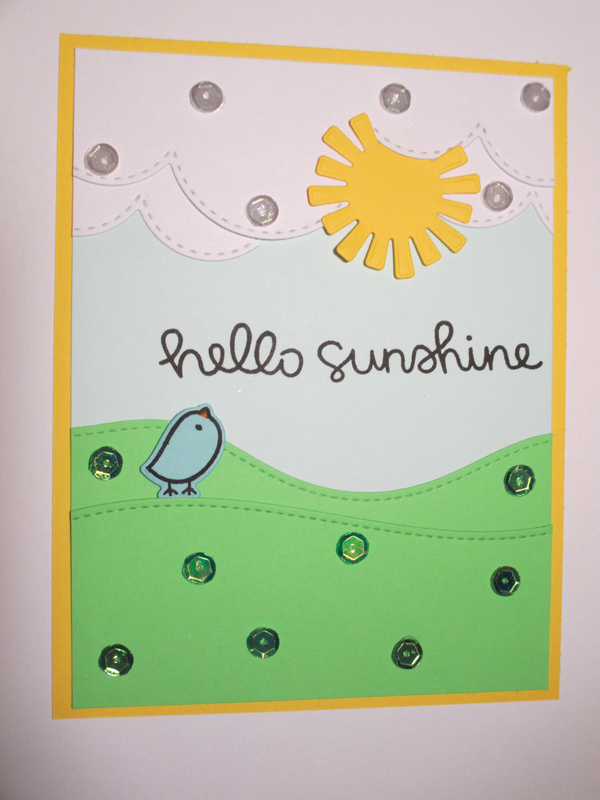 Bayer’s Pampered Stampers will collect and keep all money paid for the items. 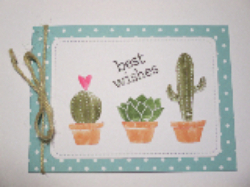 Each seller will receive a Bayer’s Pampered Stampers Gift Certificate equal to the amount of their sold merchandise. Gift certificates can be used for any in-stock merchandise, and must be used no later than December 30,2015. 8. 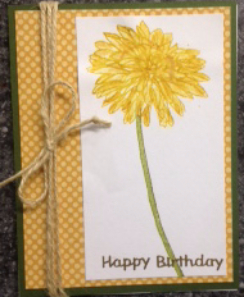 Pick up any unsold product and your gift certificate no later than Saturday, June 13th.